The final version of the IPCC AR5 WG1 assessment on the physical basis for climate change has now been published. The AR5 includes, for the first time, a specific chapter and assessment on ‘near-term’ climate change, which covers the period up to 2050, but with a specific focus on the 2016-2035 period. UPDATE (11/02/14): The text below has been edited to reflect that the final AR5 WG1 report has now been published and to add more details. 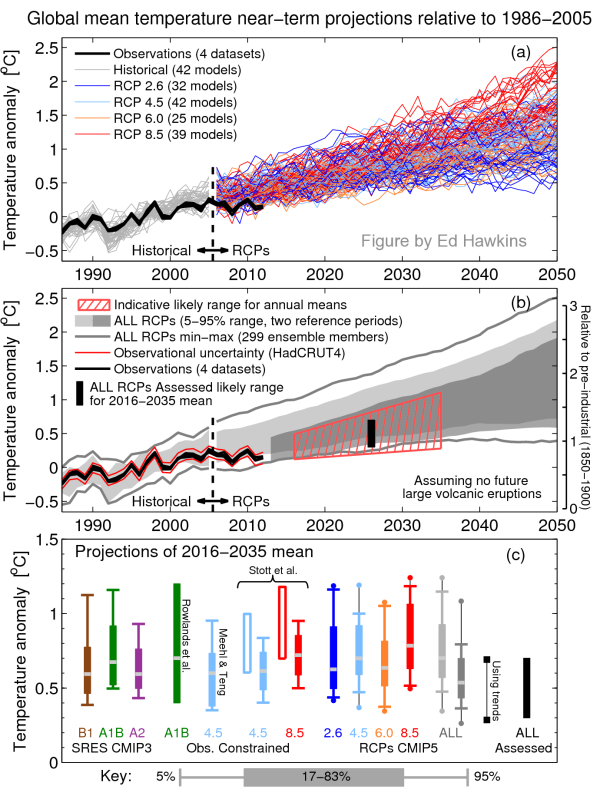 The near-term period is interesting because the projections can be verified rather soon and because understanding the changes over this period may be relevant for adaptation decision making. This period is also relatively insensitive to the particular emissions scenario, although aerosol emissions decline quite rapidly in all RCPs which may be slightly unrealistic. However, the near-term is made complicated because of the role of climate variability. The IPCC has made a probabilistic assessment of how global temperatures are projected to evolve over the next 20 or so years, which is valid for all RCPs, but with a few caveats such as no future large volcanic eruptions. The assessment has also been discussed in a recent UK Parliament Committee hearing. The synthesis figure (Fig. 11.25) is shown below, and assesses near-term global surface temperature changes. The top ‘spaghetti’ panel shows the raw CMIP5 output using one ensemble member per model. This is designed to illustrate the role of variability in the climate and that the emissions scenarios (colours) show little difference in this period. The middle panel shows the overall assessment, including the 5-95% uncertainty ranges from the raw simulations using two reference periods – 1986-2005 (light grey) & 2006-2012 (dark grey). The observations and their uncertainty are also shown. The red hatched region shows an indicative ‘likely’ (>66%) forecast for global mean surface temperature during 2016-2035 and the black bar shows the assessed likely range for the mean of 2016-2035 which is 0.3-0.7°C above the mean of 1986-2005. This assessment is made with ‘medium confidence’. The bottom panel summarises some of the evidence used in the overall assessment which includes estimates from: (i) a range of multi-model estimates, (ii) GCM simulations constrained by observations, (iii) initialised predictions, (iv) plausible future rates of change. The assessment also considers the sensitivity of the projections to the choice of reference period. The full description and discussion of this figure (Section 11.3.6.3), along with the rationale for the assessed range is also worth reading. Note that the observations for 2012 are just outside the 5-95% range from the simulations (using the 1986-2005 reference period), differing from some previous analyses shown here on Climate Lab Book. This small change in the percentile is partly because in this version: (i) the simulations are not masked in the same way as the observations, (ii) a different reference period is used, and (iii) all RCP scenarios are used. Other reference periods would give slightly different percentiles. Figure 11.9 is a similar figure using RCP4.5 only, with some additional focus on the next 10 years. A key development in AR5 compared to AR4 is that these projections are more easily tested in the next few years, and this is a very welcome and positive addition. The full chapter discusses changes in other climate variables and the ability of the current GCMs to make hindcasts. Synthesis of near-term projections of global mean surface temperature (GMST). a) Projections of annual mean GMST 1986-2050 (anomalies relative to 1986-2005) under all RCPs from CMIP5 models (grey and coloured lines, one ensemble member per model), with four observational datasets for the period 1986-2012. b) as a) but showing the 5-95% range of annual mean CMIP5 projections (using one ensemble member per model) for all RCPs using a reference period of 1986-2005 (light grey shade) and a reference period of 2006-2012, together with the observed anomaly for (2006-2012)-(1986-2005) of 0.16°C (dark grey shade). The percentiles for 2006 onwards have been smoothed with a 5-year running mean for clarity. The maximum and minimum values from CMIP5 using all ensemble members and the 1986-2005 reference period are shown by the grey lines (also smoothed after 2006). Black lines show the observational estimates. The red hatched region shows the indicative likely range for annual mean GMST during the period 2016-2035 based on the “ALL RCPs Assessed” likely range for the 20-year mean GMST anomaly for 2016-2035, which is shown as a black bar. The temperature scale relative to pre-industrial climate on the right hand side assumes a warming of GMST prior to 1986-2005 of 0.61°C estimated from HadCRUT4.c) A synthesis of projections for the mean GMST anomaly for 2016–2035 relative to 1986–2005. The box and whiskers represent the 66% and 90% ranges. 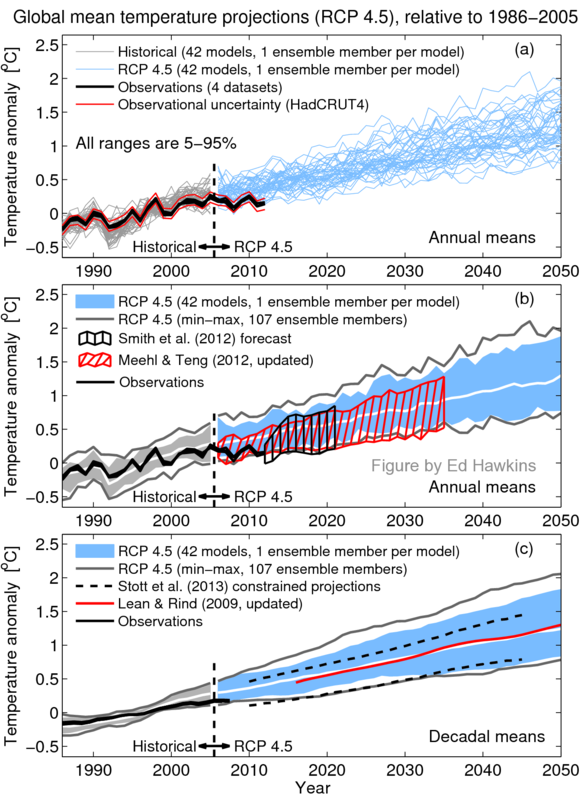 Shown are: unconstrained SRES CMIP3 and RCP CMIP5 projections; observationally constrained projections (Rowlands et al. (2012) for SRES A1B scenario, updated to remove simulations with large future volcanic eruptions; Meehl and Teng (2012) for RCP4.5 scenario, updated to include 14 CMIP5 models; Stott et al. (2013), based on 6 CMIP5 models with unconstrained 66% ranges for these 6 models shown as unfilled boxes. ); unconstrained projections for all four RCP scenarios using two reference periods as in panel b (light grey and dark grey shades, consistent with panel b); 90% range estimated using CMIP5 trends for the period 2012–2035 and the observed GMST anomaly for 2012; an overall likely (>66%) assessed range for all RCP scenarios. The dots for the CMIP5 estimates show the maximum and minimum values using all ensemble members. The medians (or maximum likelihood estimate for Rowlands et al. (2012)) are indicated by a grey band. Great work by Rowan & you, Ed! Thanks GJ – your help was invaluable, and much appreciated. Are the observations referenced to the (1986-2005) — so same as light grey shade? Is the dark grey the same as the light grey but just rebaselined using 2006-2012? Hi Lucia – observations and light grey shading both relative to 1986-2005. Dark grey is models referenced to 2006-12, but shifted by observed difference between the two reference periods to ensure consistency with y-axis. Red hatched and black bar also relative to 1986-2005 and are expert judgement based on evidence in panel c which includes raw models, observationally constrained models and plausible future trends. Hope this helps! I realise the caption is quite long! Lots more information in text which accompanies this figure at end of Chapter 11. The use of two baselines on one graph was puzzling me. I figured there was info in the full report, but I wanted confirmation! Dark grey is models referenced to 2006-12, but shifted by observed difference between the two reference periods to ensure consistency with y-axis. Isn’t that called moving the goal posts ? In what way is it moving the goalposts? It is done to ensure plotting consistency for the future projections. Just a thought, but maybe you should re-draw your scary header graph to match the reality of virtually zero temperature change over the past 20 years that is obvious in the actual data shown in the graphs. A. Paquette, maybe his header graph is intended to represent total atmosphere/ocean heat content – not just surface temperatures. That’s what’s important, after all. A future blog post will show the updated version of the figure which was used in IPCC AR5. Hi Ed: good blog and I was glad that lucia (I think) linked to it so I could find it (or a commenter there did). And the fact that you are an AR5 WG1 contributor is even better. Anyway, this may be somewhat hand-waving-ish – but could you say that the difference in panel (b) of the figure between the dark grey and light gray, is a sort of “observational constraint”? Essentially, we observe that the record is that 2006-2012 is warmer than 1986-2005. But we need to normalize the models somehow (I was reading elsewhere on how even if a model trend might be overall consistent, the absolute temperature output from the model in can be systematically higher or lower than the observations). So if we start our comparison using 1986-2005 and project forward from 2006 (call this path A), but then observe that 2006-2012 average realized is underneath the projected path A, we could observationally constrain to get a second path B which projects forward from 2013. Yes – using the recent reference period is a sort of observational constraint, although the Stott et al paper discussed in panel c is a more rigorous and comprehensive approach. I plan to read the paper in the near-term. A second question if I may. Most of the comparisons in panel (c) use box and whiskers where, as would be expected, the boxes are clustered around a central tendency and the whiskers are outliers. But the A1B Rowlands et al section shows just a very tall set of “boxes” with no whiskers on the outskirts. Why does this study (or, the way it gets summarized in the graph) differ so much from the way the other model results look? The Rowlands paper did not quote 5 & 95% confidence intervals so they cannot be included. It is a rather different approach using the climateprediction.net citizen science project and produces larger uncertainty ranges. Hi Ed – I printed out the Stott et at (2013) paper and read it (link above for interested readers). The level was about right or slightly ahead of my current climate science knowledge in terms of the methodological details, but I can certainly grasp the overall methodology, data and conclusions. So thanks for that to you and your colleagues. 1) CMIP5 seems to be the current most recent standard “state of the art” in the latest papers (such as Stott et al (2013), etc). I’m assuming you are well informed about future models, so what (if any) are the plans/schedule to update or replace these? Will there be a “CMIP6”, for example, and if so, when? Would a CMIP6 have updated individual models from the different research centres, or mostly CMIP5 models with different inputs/assumptions. 2) For the time being, regarding CMIP5, if someone wanted to download & explore the data on the various results (eg, the data that is underlying the “spaghetti graphs”, is the best source the following: http://cmip-pcmdi.llnl.gov/cmip5/ ) ? 1) Yes, CMIP5 is the latest set of simulations. Initial planning for CMIP6 is underway, which will include updated models, but will not be available for a few years yet. 2) The website you quote is the comprehensive CMIP5 database. Some of the data is more easily plottable and downloadable from the Climate Explorer at KNMI (http://climexp.knmi.nl/), certainly for a quick look. The AR4 A1B “likely” range shown above is much narrower than the “likely” range shown in AR5 Fig 1-4 (overview of previous IPCC projections), even accounting for the different time period (i.e. centred at 2025 here, and 2035 in Fig 1-4). The difference seems to be that Fig 11-25 uses the spread of the model ensemble, while Fig 1-4 uses the +60/-40 % “likely” range relative to mean warming, as assessed in AR4 for total uncertainty in projections to 2090-2099. One concern I have about using the 60-40 uncertainty envelope for relatively near-term projections, is that it is quite sensitive to the choice of baseline. For example, for 2035 moving the baseline from 1980-99 to 1961-90 changes the model spread by very little (maybe 5%), but expands the “likely range” by about 20% (since mean warming in A1B goes from about 1.1 to 1.3 deg C). (P.S. Don’t get me wrong! I consider the final draft version of Fig 1-4 a great improvement, as it corrects a severe baselining mistake in the projections, and also uses CMIP3 based projections instead of the AR4 SCM outputs). Pingback: Spinning the climate model-observations comparison. Part III | Climate Etc. The reference periods used in AR5 is 1986-2005 but for AR4 it is 1981- 2000. What difference does this different reference periods mean in the projections for feature scenarios? And why are these different periods used?